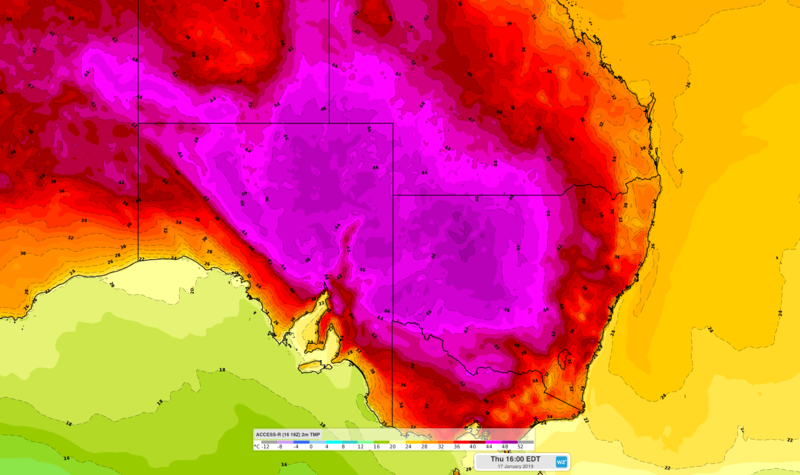 Record-challenging heat will linger through central and eastern Australia during the next two days, as the mercury starts to drop in the nation's south. 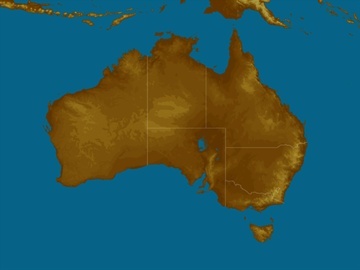 A widespread heatwave has affected a large swathe of Australia this week. On Tuesday and Wednesday, the temperature exceeded 45 degrees in every state and territory except for Tasmania and the ACT, with some registering temperatures above 49 degrees. According to the Bureau of Meteorology, Saturday, Sunday, Monday and Tuesday all ranked among Australia's 10 warmest days on record based on the national average temperature. Nights have also been oppressive. Wednesday night was Tibooburra's warmest on record, with the mercury only dropping to a low of 34.0 degrees at 5:25am on Thursday. Their previous record was 33.9 degrees from 1964, with data available back to 1910. Fortunately, this spell of hot weather is now coming to an end for some parts of the country, as cooler air starts to spread over the nation's south. After reaching 40-42 degrees for three days in a row, Adelaide is forecast to hit 37 degrees today and only 29 on Friday. Melbourne's expected top of 37 degrees today - easily its hottest day of the week - will be followed by a more comfortable 28 degrees on Friday and just 23 degrees on Saturday. 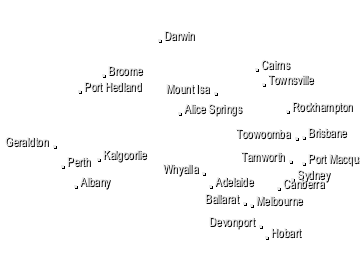 But while southern Australia is cooling down, there are still a few places further north that are yet to see their highest temperatures of is event. Temperatures are forecast to reach up to 47-48 degrees in western NSW and northern districts of SA on Thursday, which is likely to challenge maximum temperature in some locations. Parts of central western NSW should hit the mid-forties, including Dubbo, which is tipped to reach 45 degrees on Thursday. Dubbo's hottest day on record was 46.1 degrees in February 2011. Image: Expected surface temperatures in central and southeastern Australia on Thursday afternoon, according to the ACCESS-R model. This heat will persist across central and eastern Australia during Thursday night and should spread towards the east on Friday, allowing parts of western Sydney to end the working week in the mid-forties. A sea breeze should limit heating near the coast, although the city's forecast top of 34 degrees on Friday will be noticable warm do to humidity. Canberra is forecast to reach 41 degrees today and 40 on Friday, which would round out the capital city's first four-day spell at or above 40 degrees on record. The cool air that's starting to affect southern Australia will gradually spread further north on Friday and the weekend, bringing some relief in NSW and SA. Canberra is forecast to see more manageable tops of 32-33 degrees on Saturday and Sunday, while Penrith is forecast to drop from 45 degrees on Friday, to 33 on Saturday. Looking ahead, another pulse of hot air is expected to sweep across southern Australia next week. While this spell of heat isn't likely to last as long as the current heatwave, some parts of southern Australia could experience higher temperatures than they did this week.